Experience: Salvatore Ferragamo Groove 2 Double Gancini Slide Sandals. Gearing up in Style for the Summer. When it comes to blue shoes or beach sandals, no one does it better than Salvatore Ferragamo. This quintessential brand was launched in the early 1900s by its founder Salvatore Ferragamo. Having made his first pair of shoes at age nine for his sisters to wear at their church confirmation, Ferragamo studied the art of shoemaking in Napoli where he opened a small shoe store at his parent's home. After moving to Boston in 1914—where one of his brothers worked at a cowboy boot factory— and then to Santa Barbara, California in 1919, he opened his his own boot shop to quickly become the 'Shoemaker to the Stars'. After a short stint in the US, Salvatore moved back to Firenze, Italy where he established his company as we know it today —still a family owned business and one of the most renowned luxurious shoemakers in the world. 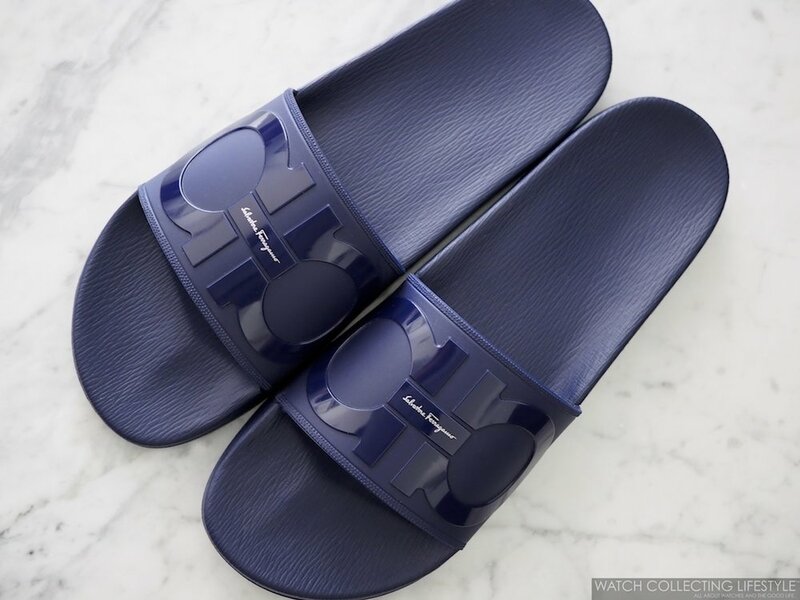 If you want to gear up in style for the summer and wear pool/beach sandals that perfectly match the blue tones of those Vilebrequin swimsuits you love wearing, the Salvatore Ferragamo Groove 2 Double Gancini slide sandals are not only very stylish but also extremely comfortable. 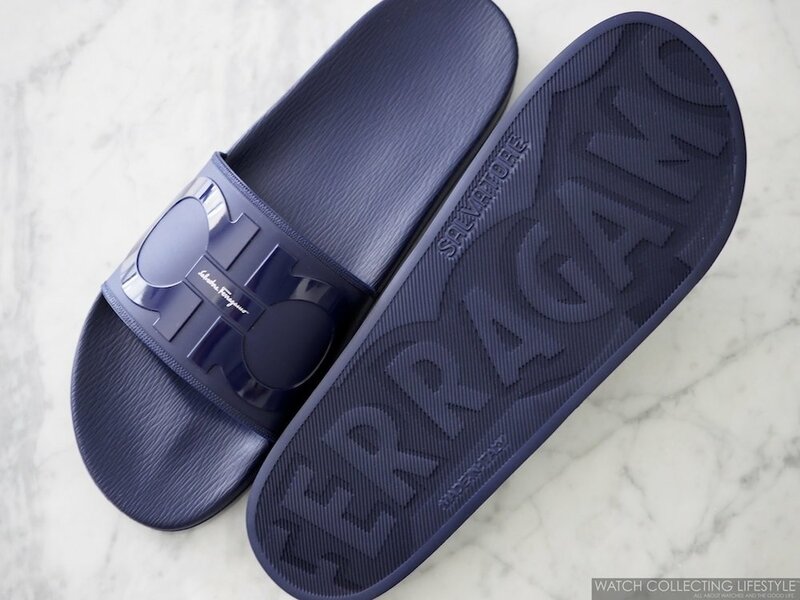 These elevated Italian slide sandals made of very high-quality rubber feature an embossed raised double 'gancini' —shaped like a backwards horseshoe— that Ferragamo has used as his signature mark since 1969. With a very comfortable contoured foot bed, these sandals are available in black, white or indigo blue. Next time you're getting ready for a pool or beach day in Saint-Tropez or Mykonos, keep in mind that your look is as good as what's on your feet and on your wrist. If you are a true watchlifestyler and trendsetter, better protect your feet bottoms from the heat with this Salvatore Ferragamo Groove 2 Double Gancini Slide Sandals that will make you look like a million bucks along with that new 'Brick' you just added to the collection. Sticker Price $195 USD—watch not included. For more info on Salvatore Ferragamo click here. Posted on June 6, 2018 by Editor & Publisher and filed under Fashion & Style and tagged Salvatore Ferragamo Groove 2 Double Gancini Slide Sandals Salvatore Ferragamo Fashion and Style Audemars Piguet Royal Oak Offshore Audemars Piguet Royal Oak Offshore ref. 26470OR Audemars Piguet Royal Oak Offshore ref. 26470OR.OO.1000OR.02 Most Popular.